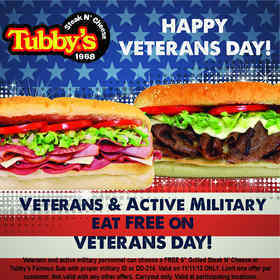 ROSEVILLE, MI--(Marketwired - Nov 7, 2013) - In honor of Veterans Day, Tubby's Sub Shops, www.tubbysgrilled.com, announced it is offering all veterans and active duty military the choice of free carryout of its popular 6" Grilled Steak N' Cheese or Tubby's Famous Sub. "Tubby's wants to do everything we can to assist our veterans. This offer is a small way that we can show our appreciation," said Robert Paganes, Tubby's CEO. He revealed that the company is also in the process of developing a program that will provide assistance to veterans interested in franchising with Tubby's. 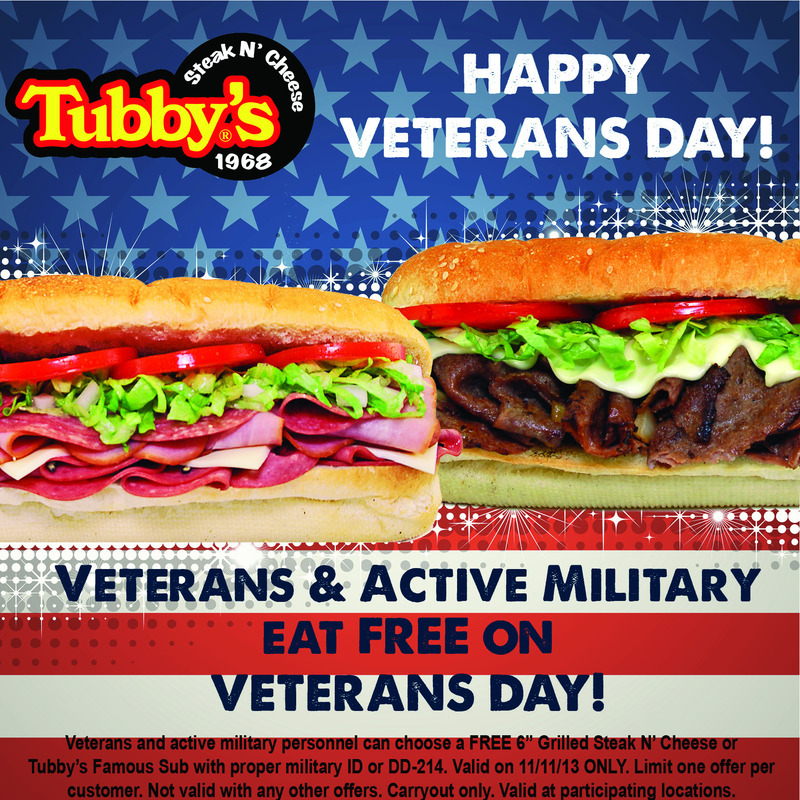 All veterans -- including active duty, retired or former U.S. military with a military ID or DD-214 are eligible for this free offer available during normal store hours on Monday, November 11, 2013, at any of Tubby's participating locations throughout Michigan. One offer is available per customer. For more information and to find a Tubby's location near you, visit www.tubbysgrilled.com. Founded in 1968 and headquartered in Roseville, Mich., Tubby's Sub Shops is a family-owned business that has grown to 65 locations throughout Michigan. Leading the company's growth is CEO Robert Paganes, brother of the company's founder Richard Paganes. Known for its unwavering commitment to quality products and customer service, Tubby's offers a variety of premium quality grilled submarines and other menu items that are available for dining-in, carryout, delivery and catered events. Tubby's participates in various community events throughout the year and is a proud sponsor of the Detroit Lions. For more information, visit www.tubbysgrilled.com.